A reader, also called a lector (in Greek, αναγνώστης, anagnostis or anagnostes; in Slavonic, Чтецъ, chtets) is the second-highest of the minor orders of the Orthodox Church. It is a clerical order to which a man is tonsured and ordained, setting him apart as blessed by the bishop to read in services and in the Divine Liturgy. In the past, low literacy rates meant that a Reader reading in church was the main way that people would hear Scripture read. Some have argued that in societies with high literacy rates, the office of Reader is superfluous. Others, however, counter that in such societies where high literacy has caused information without meaning, the value of a dedicated Reader to prayers, psalms and epistles with parishioners is even more vital. In the Pre-Nikonian Russian Church, there existed an additional junior grade of reader called psalomshchik (in Slavonic, Ѱаломщикъ), whose sole function was to read the long Kathisma Psalms, thus permitting the reader and chanter to save their voices. This office survives in those churches that utilise the Pre-Nikonian Russian ritual: Old Believers (both priested and priestless), those parishes under ROCOR or the Moscow Patriarchate. The title of psalomshchik survives in the later reformed Nikonian Russian rite as an alternative, slightly archaic and quaint name for chanter. This order is higher than the doorkeeper (now largely obsolete) and lower than the subdeacon. The office of a reader subsumes that of a taper-bearer, and the service of ordaining a reader mentions both functions. Byzantine icons often show readers and church singers wearing a stikhar-like garment (more loose and flowing than the modern stikhar) and a pointed hat with the brim pulled out to the sides (see here, lower left corner). This distinctive garb is now obsolete. Immediately before ordination as a reader, the candidate is tonsured as a sign of his submission and obedience upon entry into the clerical state. This is a separate act, making a layperson into a clergyman, and occurs immediately prior to his ordination as a reader. The ordination itself is, like that of the subdiaconate, through Cheirothesia - literally, "to place hands" - as opposed to Cheirotonia - "to stretch out the hands" - which is practised at the ordination of bishops, priests and deacons. A reader is usually tonsured by the bishop, though in some traditions, an archpriest or archimandrite may do the tonsure with the bishop's blessing if he is not available. In monastic communities, the ruling archimandrite may tonsure those monks over which he rules. It is through ordination - not the tonsure - that one is made a reader or subdeacon; this is highlighted by the fact that the tonsure is performed only once and is not repeated before the ordination of a subdeacon. The confusion has arisen by the common reference to a man being "tonsured a reader" which, while widespread, is not technically correct. All degrees of clergy, beginning with Reader, wear the sticharion. The sticharion is a long-sleeved tunic that reaches all the way to the ground. It reminds the wearer that the grace of the Holy Spirit covers him as with a garment of salvation and joy. A reader can be distinguished from an acolyte because the reader will wear an undercassock under his sticharion, and (generally) because a reader's sticharion will be joined together by buttons on the side of the garment, where an acolyte's will be sewn up the sides. Care for the parish's liturgical books. In contemporary practice, any layperson may receive the priest's blessing to read on a particular occasion, particularly in the absence of an ordained reader. A layperson so blessed, even permanently, may not take on any of the prerogatives of an ordained reader, i.e. may not wear a cassock or sticharion within or outside of services. 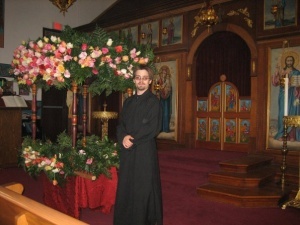 Readers are permitted to wear a cassock, although many do so only when attending services; this is done as a sign of his suppression of his own tastes, will and desires, and his canonical obedience to God, his bishop and the liturgical and canonical norms of the Church. Even in those jurisdictions which favour them, readers will generally not wear a clergy shirt. While reading in church, the reader will generally wear a sticharion; and in some places, will do so when receiving communion. What a reader wears while conducting his duties can vary, however, and many bishops and priests will allow a reader to perform his function dressed only in a cassock or, if a monk, outer cassock (riassa/exoraso). Often, a bishop will decree what vesting practice he wishes to be followed within his own diocese; for an example, see here, section VIII. In addition to living the Christian life, the newly-ordained Reader is, on the day of his ordination, instructed to read Scriptures daily. As a member of the first step of the priesthood, he must also pray daily. In addition to this, it is expected that the Reader will have memorised commonly-used liturgical prayers, will be familiar with Tones, Troparia and Kontakia, as well as the books to construct services - the Horologion, the Epistle Book, the Menaion, the Triodion and the Pentecostarion. The ordination service specifies that the Reader should prepare himself for a higher degree by living a holy life, thus implying that, while a Reader should still be living a Christian life, he is not immediately expected to be held to the standard of higher clergy, but to work towards this. Some material retrieved from Wikipedia article on 'Reader', 4/Mar/2011 revision. A Guide for Readers in the Orthodox Church, by Fr Geoffrey Korz. This page was last edited on November 25, 2014, at 23:39.